So far, I've had no luck in finding any hardware solution that serves me better than a piece of paper and a fountain pen can. 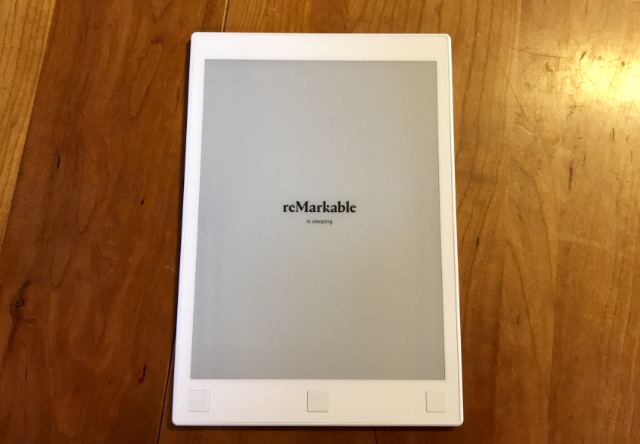 Unfortunately, at its release, the reMarkable wasn't all that remarkable. While the latency of the tablet's E Ink display and pen were close to non-existent, the rest of its software felt under baked. The UI was far from intuitive. It functioned as an e-reader, but only barely. While you could export what you'd written to a smartphone or computer, there was no way to edit the text once it was there. It felt like a slog to use. I asked a colleague in Canada if he'd like to give it a try. I mailed it out to him and, a few weeks later, it came back to me, marked not "deliverable." I didn't have time to ship it out again as I was preparing to spend several months on the road. I threw it into the back of my workspace's storage cupboard. It lurked there until today. One of the things about my gig that folks always seem surprised by is that I can't sell any of the review samples I'm given. While some writers do it as part of their income, it's highly unethical. Clearing out my workspace of flotsam that I've already written about can be a chore: I either have to find someone who needs it, gift it to a pal or donate it to a local charity. When the reMarkable surfaced again, I thought I'd charge it up and pass it along to the first person that wanted it. As it hadn't been touched in so long, I had missed out on a couple of software updates, the latest of which popped last summer. In the time since I'd last played with the tablet, they'd fixed a number of UI annoyances. The device's e-reader functionality has become marginally better. That's all fine and well. What led me to cuss out loud was the fact that the Remarkable now supports OCR. Suddenly, the reMarkable actually feels remarkable to me. Over the past few days, I've been using it for a lot of my note taking and to noodle out paragraphs that my brain can't seem to churn out with a keyboard. It's been utterly wonderful. There's no need to transcribe a damn thing. I tap an icon on the UI and BOOM: editable text. That said, the tablet's OCR wizardry isn't perfect. In order for it to work, you need to be connected to WiFi. But that feels like a small quibble over such a large functionality upgrade. Maybe check out your old hardware one final time before passing it on to someone else. You just might find something to delight you.